Why is some candy hard while others are soft? Why do some last forever and others melt in your mouth? The texture and some behaviors of candy are due to their structure on the atomic level. Rock candy is made up of large crystals. Crystals are made up of atoms that are lined up all the way across the candy. For a description of how to make rock candy and amorphous candy see the activity You Can Eat Crystal and Glass? Special types of candy (for example, fudge) are actually made up of very small crystals that fit together to form a solid. These candies, like most metals, are called polycrystalline, meaning many crystals. These crystals, also called grains, need a very special process to form during the candy making procedure. The grain boundaries, or the edges in between the grains are what give these candies it’s smooth but firm texture. In this activity you will make Maple Cream Candies out of just maple syrup. You will learn about the process or making the candies and why the crystals form when they do. You will investigate the properties of the candies once they’re done, and finally get to eat them! Boiling maple syrup is VERY HOT! Adult supervision is necessary for that step. Pour ¼ cup to 4 cups of the maple syrup into the saucepan, depending on how much candy you would like to make. Four cups of maple syrup will make 2 pounds of candy. Clip the candy thermometer to the side of the saucepan so that the bottom is submerged in the maple syrup and turn it so you can read the numbers. Make sure there is plenty of extra room in the saucepan because the maple syrup will bubble up. If you’re not using a candy mold, lay a piece of wax paper on the counter and butter one side of it, as shown. If you’re using a candy mold, butter the candy mold. Turn the saucepan on medium-high heat and watch it carefully as the temperature rises. Do not stir the maple syrup during this process. Don’t turn your back on it! The maple syrup will begin bubbling very quickly. Watch the thermometer closely. When it reaches 235 degrees Fahrenheit, remove it from the heat. Some thermometers have a “soft ball” label at 235 degrees. As it cools the candy wants to form crystals. If you stir the syrup at this point your will start the crystallization process. If crystals start forming too early they’ll get too big because they’ll have longer to from. The key to smooth polycrystalline candy is to have really small crystals, so we need to let the maple cool before we start to stir it. After you remove it from the heat, do not stir or remove the thermometer. Wait for the thermometer to read 110 degrees Fahrenheit. At this point, begin stirring it vigorously with a spoon. Make sure you stir all of the maple syrup, scraping from the sides of the pan. This is when the tiny crystals will be forming. In a few minutes it will become opaque, begin to look creamy and start to thicken. Keep stirring until it is stiff, and then spoon it onto the wax paper. Quickly smooth the top until it is ¼ to ½ and inch tall. Let it cool completely, then cut it into squares. You’ve now made maple candy! Observe your candy. How firm is it? How hard do you have to press to make a dent? Try tearing a piece instead of cutting it. What do the edges look like where you tore it? Is it smooth or ruff? Taste it! What is the texture like? How long can you keep it in your mouth before it dissolves? Now that you’ve made polycrystalline candy, trying making the other types! Check out the You Can Eat Crystal and Glass? Or, take your new knowledge of how to make polycrystalline maple candy and try some others. Try out a fudge recipe and see if you can explain what’s happening at each step. Because polycrystalline candy like these maple candies are made up of a lot of very small grains they have a firm texture. But, the spaces in between the grains (called grain boundaries) are very weak, which makes the candy easy to break and melt in your mouth quickly. 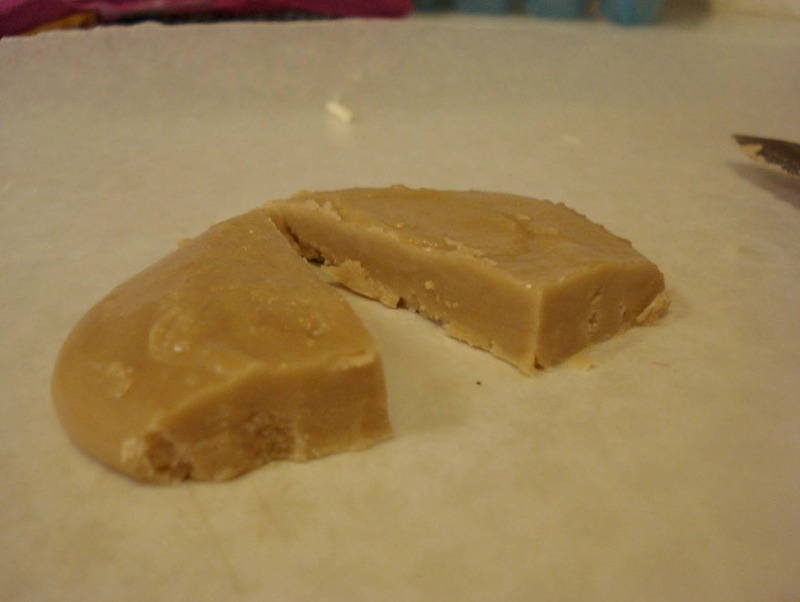 This firm yet smooth texture that makes fudge so unique is due to the way it is structured on the molecular level. To get this unique structure you must follow a special procedure when making maple candies or fudge. While polycrystalline candy is not common, polycrystalline metal is very typical and makes up most of the metal we use.